1. Guesstimates - The root system is the mystery, which is why it’s a “guesstimate” and not an estimate. I usually won’t need to go to the property because what you can see above ground is what I would see. There are indicators above ground that you can describe over the phone [203-736-0664] answering the questions I ask to help me determine what difficulties the root system will present, once we dig in. In this way I can help you with a “ball-park” figure. 2. Eradication - Eradicating poison ivy roots, runners and climbers (climbers under 2-inch in diameter) by digging the plant’s entire root system out using a double set of gloves, a trowel and sometimes a shovel. Pulling it off the tree as high as can be pulled down from the ground. Based on different factors sometimes the full length of the climber comes completely off the tree. 3. Tree Root Specialist - Where an old poison ivy climber has developed over many years, those particularly thick poison ivy roots are dug out (two-inch diameter or thicker) that are tougher to extract around the base of a tree and the climber is pulled off the tree as high as can be done with the assistance of a ladder. 4. Tree Climbing Specialist - A worker who climbs a tree to remove the vines that cannot be taken down from standing on the ground or on a ladder. This tree specialist can also remove the most humongous of vines that literally cannot be pulled off by human strength alone but require a winch on the back of a pickup truck. 5. Ripping - A less thorough but quicker method for getting out a large ground cover of poison ivy in a shorter period of time. This method requires a 2nd visit at a later point in time to dig out the remaining roots more thoroughly. Ripping out poison ivy, grabbing the vines and pulling as much of the root out of the ground as possible. When new leaves shows themselves these roots are dug out meticulously, one at a time, to finish off the eradication. 6. Stone Walls - eradicating the roots from out, under and in-between stones in walls sometimes calls for relocating stones and putting them back or, considering the situation, moving the stone wall laterally by some feet. An hour-long Poison Ivy Documentary for Do-It-Yourselfers. This video includes the best poison ivy identification lesson on the web for those who want or need to know what it really looks like! 8. Private Training - Train individuals (1 or up to 3 at a time), on one of their properties that has poison ivy on it, in the Poison Ivy Eradication and Protection Protocol. This is a common sense procedure developed by “The Gloved Hand” for safety from the ivy's oil/resin while working with the plant. The protocol was developed out of necessity, creating results through trial and error. A trainee(s) is brought up to speed on this protocol in one session. There will be some time spent working directly with the poison ivy plant (wearing gloves of course!) while avoiding the invisible culprit - urushiol - in all situations. Optionally, a 2nd training further acclimates an individual to becoming more confident and comfortable within this routine that concerns your safety. 9. Professional Training - A one-to-one professional training for an individual to bring back to their current company, go into the business of poison ivy removal for oneself, or to become a sub-contractor of “The Gloved Hand”. This 6-hour training is divided into 3-hour sessions, each one on a separate day. Time will be spent handling and working with the poison ivy plant each day (wearing gloves). A certificate from “The Gloved Hand” is mailed to the Trainee upon completion of the training. Watching the Poison Ivy Documentary prior to this training is definitely encouraged. 10. Laboratory Workshop - Train groups in a fun and interactive way, incorporating three learning styles: watching, doing and verbally observing others practicing the protocol developed by “The Gloved Hand”. These procedures are to keep everyone safe from exposure to the ivy’s oil/resin, urushiol. Watching the Poison Ivy Documentary prior to this training is highly recommended. The training takes place indoors in a laboratory-like setting and does not include any contact with poison ivy. If a group wishes to continue by gaining experience of working hands-on with poison ivy under the guidance of “The Gloved Hand,” then taking the following “In-the-Field Workshop” will round-out the training experience. To do a “Search & Assess” = twice the travel fee – $20 minimum. The cost of this site visit is NOT deducted from the actual job. Specialist Hauling Fees: $500/level dump truck or $125/cubic yard, for example: 2" diameter vine at 50' in height may cost around $50 in hauling, however, distance to dumping site and other circumstances will vary the price. DIY-ers, work at your own risk – and be aware. I am especially interested in using more subcontractors because my business continues to grow. $360 for one person includes both days. Anyone taking this professional training can choose to override the direct fee by subcontracting to “The Gloved Hand” for approximately 50 hours spread out over months and starting at the base wage of $18 per hour. Also, a combination of labor and dollars can be arranged to compensate for the training. If a person chooses to subcontract with “The Gloved Hand” for further work the responsibilities taken on within the company are accompanied by pay increases. ––> NOTE: Let “The Gloved Hand” know what your organization can afford. because of our meticulous dedication to poison ivy eradication. Poisson Ivy roots are dug out using a trowel and shovel to extract the entire root system, basically an organic approach. Pictured below is William Bartlett, my Tree Specialist Eradicator. For the largest tree-climbing vines he uses a come-a-long to bring them down. He will also climb up a tree when he has to. He's tackled to the ground some thick, record-breaking vines. I'm posing with a large base of poison ivy roots that he pulled out for me. He's been in the business for over 30 years. Same tuber: if you look closely enough, this picture below (click to enlarge) shows how skinny the long roots will become the deeper we explore. 1. Guesstimates - The root system is the mystery, which is why it's a "guesstimate" and not an estimate. I usually won't need to go to the property because what you can see above ground is what I would see. There are indicators above ground that you can describe over the phone to me. [203-736-0664] Answering the questions I ask will help me determine what difficulties the root system will present, once we dig in. In this way I can help you with a 'ball-park" figure. 2. Eradication - Eradicating poison ivy roots, runners and climbers (climbers under 2-inch in diameter) by digging the plant's entire root system out using a double set of gloves, a trowel, a shovel and pulling vines off the tree. 3. Tree Root Specialist - Where an old poison ivy climber has developed over many years, its particularly thick poison ivy roots are dug out (two-inch diameter or thicker) around the base of a tree and the climber is pulled off the tree as high as can be done with the assistance of a ladder. 5. Ripping - Ripping out poison ivy without the use of tools. By hand, pulling out as much of the root as posiible. This is not a coomplete eradication since some roots may still remain in the ground. This quicker method is for clearing out a larger area of poison ivy in a shorter period of time. A 2nd visit is recommended to dig out all the roots. 6. Stone Walls - eradicating the roots from out, under and in-between stones in walls sometimes calls for relocating stones and putting them back or, considering the situation, moving the stone wall laterally by some number of feet. On YouTube: an hour-long Poison Ivy Documentary for Do-It-Yourselfers. This video includes the best poison ivy identification lesson on the web and a Protection Protocol for Do-It-Yourselfers! Individuals (1 or up to 3 at a time) learn the Poison Ivy Eradication and Protection Protocol, a common sense procedure developed by "The Gloved Hand" for safety from the ivy's oil/resin while working with the plant. A trainee(s) is brought up to speed on this protocol in one session. Time is spent working directly with the poison ivy plant (wearing gloves of course!) while avoiding contamination. Viewing the Poison Ivy Documentary is recommended prior to the training. A 2nd, non-consecutive day of working with The Gloved Hand trainer brings an individual confidence within this routine that concerns their safety. 9. Professional Training - A one-to-one professional training for an individual to bring back to their current company, go into the business of poison ivy removal for oneself, or to become a sub-contractor for "The Gloved Hand." This 6-hour training is divided into 3-hour sessions, each one on a separate day. Time will be spent handling and working with the poison ivy plant each day (wearing gloves). Watching the Poison Ivy Documentary is recommended prior to this training. 10. Laboratory Workshop - Train groups in a fun and interactive way, incorporating three learning styles: watching, doing and verbally observing others practicing the protocol developed by "The Gloved Hand." 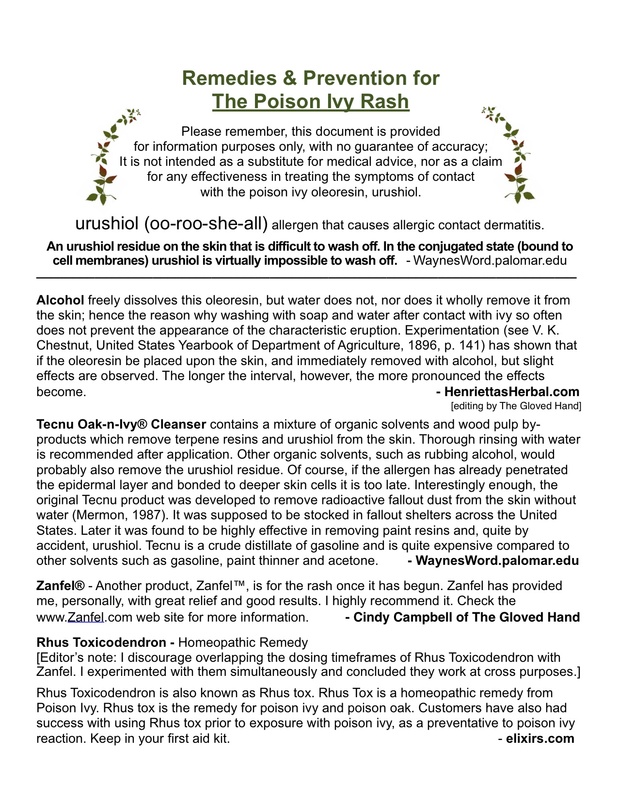 These procedures are to keep everyone safe from exposure to the ivy's oil/resin, urushiol. This training takes place indoors in a laboratory-like setting and does not include any contact with poison ivy. If a group wishes to continue gaining experience by working hands-on with poison ivy under the guidance of "The Gloved Hand," then taking the following "In-the-Field Workshop" will fill out the training experience. When I visit a poison ivy patch, I often dig up some rather interesting-looking roots. The way I explain the first one pictured below is this: when poison ivy roots are cut or ripped (you can see the cut in the first of the two photos), the sources of energy that would have normally flown through the runner, past that previously cut spot, have now bumped into a dead end. The energy collects and stores in that dead end by filling out into a root tuber. From that tuber (or rhizome), 4 or 5 roots may start out in multiple directions but also a tap-like root may begin to grow straight down, as a means to support survival of the plant under its newly threatened circumstances (of having been cut). Therefore, ripping or trimming roots just down to the ground level (not digging them out) causes the root system to "bush out" underground. This is a similar process to when one trims a bush above ground in order for it to fill out and become more bushy. This is not something I recommend, that poison ivy roots be ripped out, mowed or otherwise cut at the ground level every year and maintained this way year-in and year-out. It creates a HUGE root system and eventually a greater magnitude to the job when finally digging the entire root system out. Hello there. It is 2019 and I became involved with the poison ivy plant in 1988 when my husband and I bought a house (in Connecticut) with poison ivy on the premises. My name is Cindy. My husband Robert had previously contracted a particularly severe case of the poison ivy rash which had required medical treatment, so I proceeded to clear out our new yard by myself. I found that the most comfortable method for me was to remove the entire root system by hand. The results were good, too. While under the tutelage of a knowledgeable Yankee farmer I learned techniques regarding weather conditions and seasonal changes that make for the most productive weeding. Now I am able to identify poison ivy in the dormant season when there are no leaves on the plant; I can eradicate poison ivy before the season even begins! I recommend keeping this in mind when hiring The Gloved Hand. As soon as the ground thaws in March, it is possible to get started. May and June are very busy months. Work continues on through spring, summer and again, autumn is also an excellent time for poison ivy eradication - right up until the ground freezes again! After helping my husband out on our own property I began helping other relatives as well; and next, it was my neighbors calling. My business officially started for the public in 2009. Digging in to eradicate poison ivy roots is not a good idea for those with a severe allergy to poison ivy; common sense is your best ally there. Contrary to what you might think, I am not one of those rare individuals who is blessed with a natural immunity to the plant. Armed with tenacity however, I now have protocols for my personal protection and can train others to do the same. --> NOTE: Please let "The Gloved Hand" know what your organization can afford. 1. Guesstimates - OVER THE PHONE - No Cost. 203-736-0664 or email me your # and I will contact you. 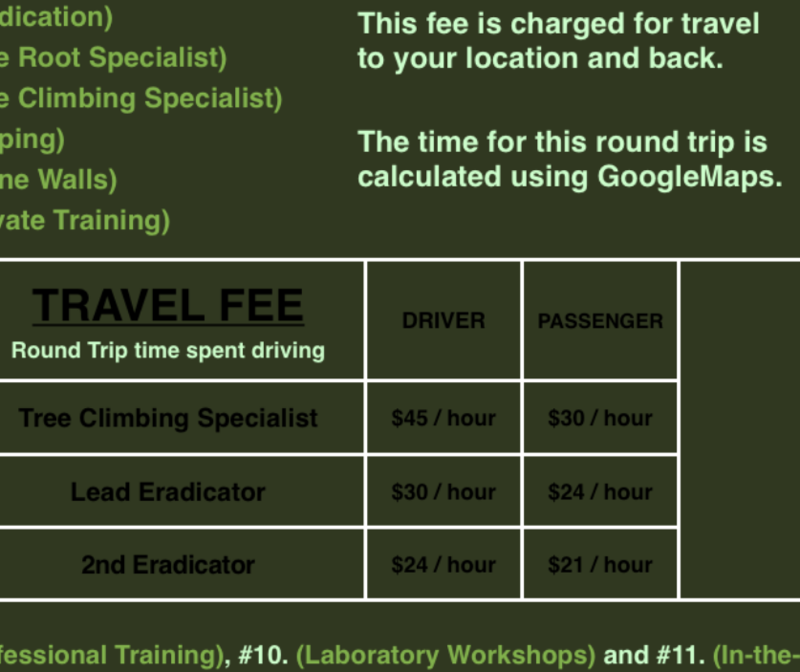 A "Search & Assess" fee is double the travel fee ($20 minimum). Travel fee rates are listed near the bottom of this webpage. The cost of this "Search & Assess"
visit is NOT deducted from the actual job. DIY-ers, work at your own risk - and be aware. Please share this video with others when you find it appropriate. "The more the merrier." There just aren't enough people doing what I do. ;-) I am especially interested in using additional subconractors as my business continues to grow. To the left of the video is a list of the different sections in this video. You can see from the second photo that this root was dug out of a deep hole. 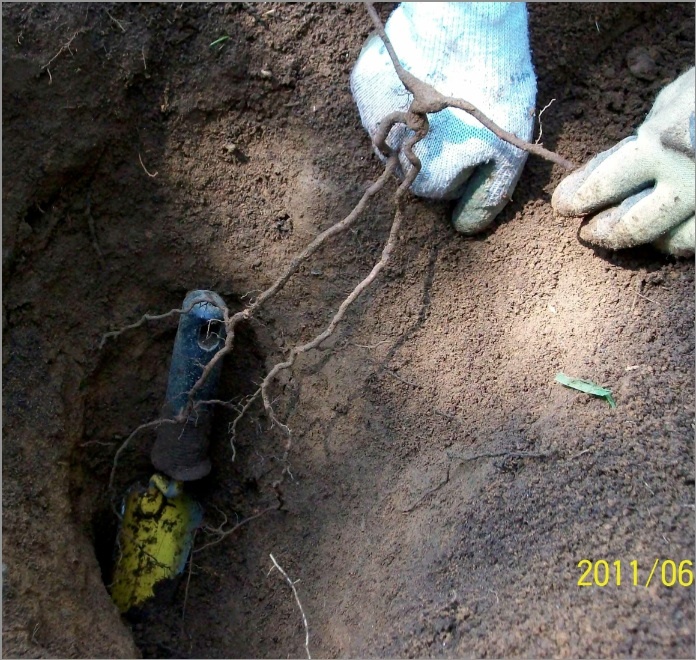 When we measured the hole and the root itself, they measured nearly two feet. Poison ivy, in its undisturbed state, normally runs less than an inch under the earth's surface and fairly parallel to the ground. Any secondary roots growing off of a typical runner are only 4 or 5 inches in length and grow at an acute angle to the runner. Abberant roots like the one pictured are found to grow vertically, perpendicular to the earth's surface. When we start chasing a root that goes straight down like this, I feel that 8" is an adequate depth for digging the root out. Once past 8", a root often is too skinny for survival on it's own, especially at such a depth. A poison ivy root tuber: at the top left corner of this tuber you can see the original cut (click to enlarge), causing this tuber to develop in the first place.